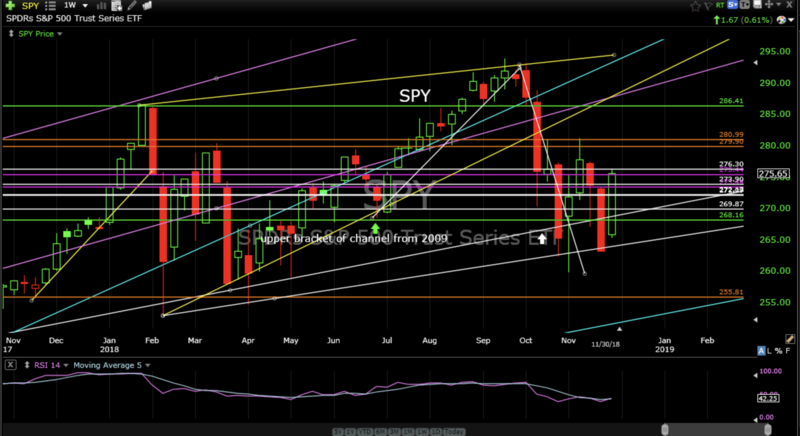 SPY bounced last week off rising support established by the range lows of early this year. While this is a positive for the market, high volatility and large daily ranges are not. Gigantic up days like we had last Wednesday are more common during downward trending markets than upward trending markets. This doesn’t mean SPY has not bottomed it just means we should remain cautious. 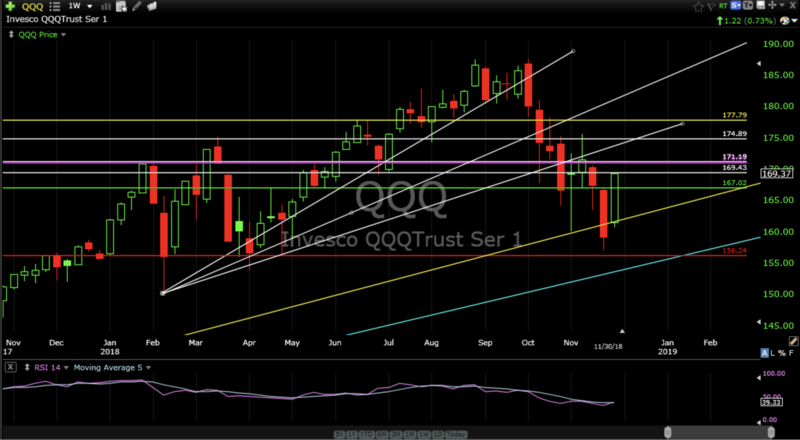 QQQ also had a big up week getting bid at rising support after closing the previous week below this rising support zone (yellow). The previous week’s closing below is still bothersome. I would remain cautious. 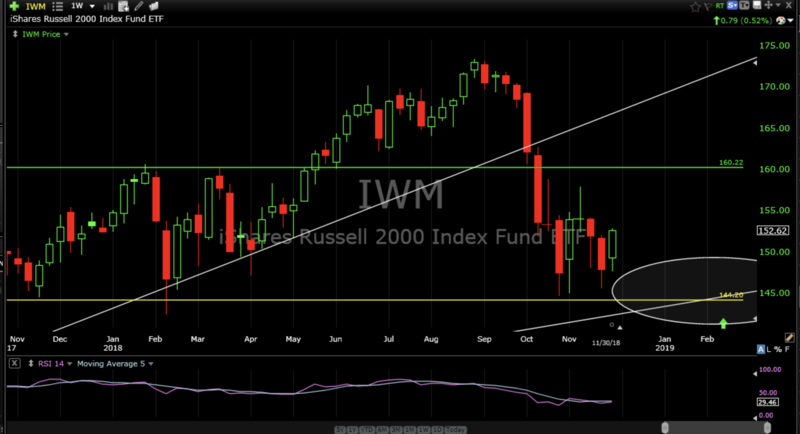 IWM still doesn’t look like it has formed any kind of sustainable bottom. It should at least drift down into a better support area (see chart) to give the bulls a better anchor to begin another leg up. 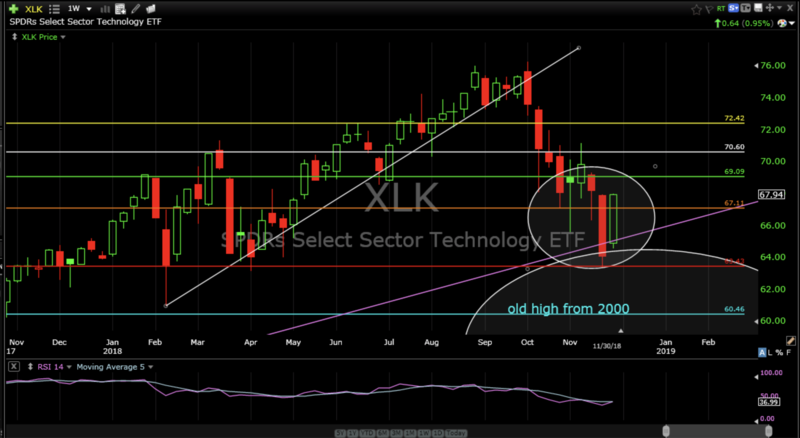 XLK, the technology sector ETF, has bounced sloppily off the target I discussed on October 21. 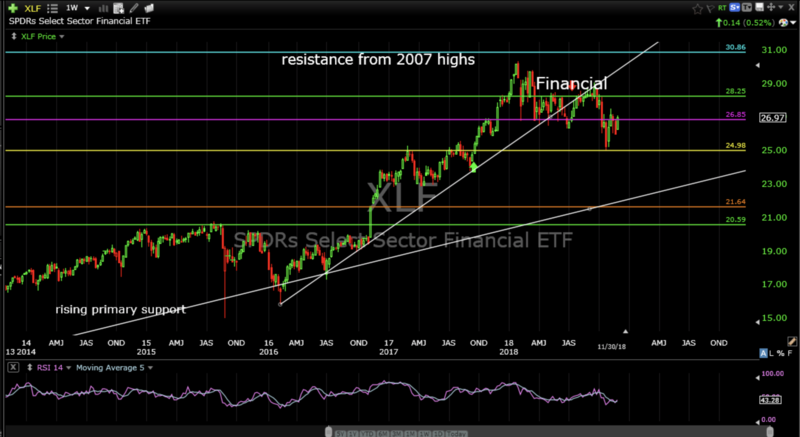 Like QQQ, XLK closed the previous week just below this rising intermediate support zone. 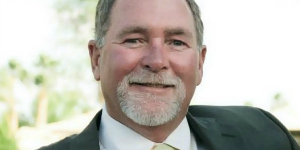 The good news is it bounced, the bad news is it still closed the previous week below…and, it couldn’t close above last weeks high which is a little bothersome…mixed signals for sure. I’m long. 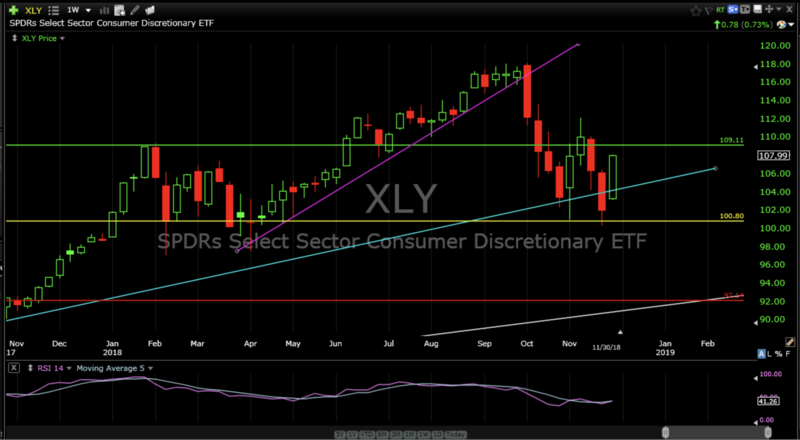 XLY, the consumer discretionary ETF, looks similar in that it closed the previous week below rising support but landed just below to get bid up at the bottom of the accumulation phase from early this year (yellow line). 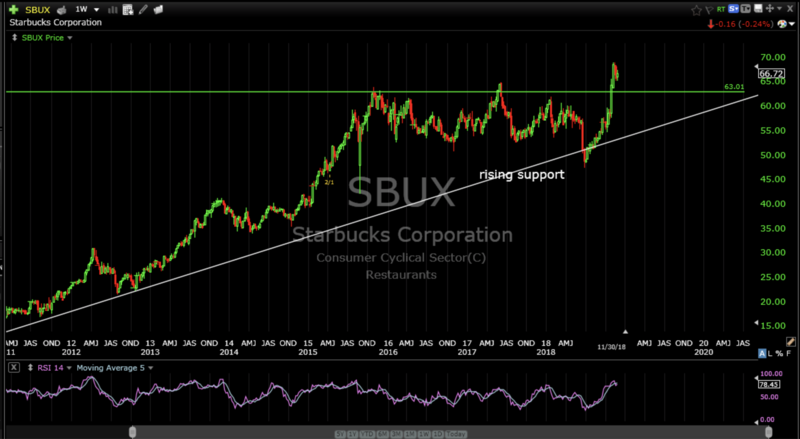 At least the bid up came from decent support after breaking rising support, unlike XLK. Remain cautious as price is just below resistance from the early 2018 top and may fade back soon. XLF, the financial sector ETF, looks like crap even though American Express (AXP) and CME Group Inc (CME) are making new all time highs. One must be very picky in this group. 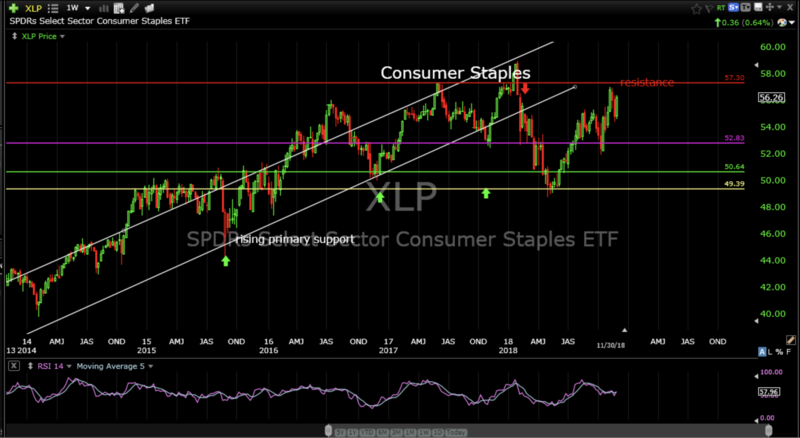 XLP, the consumer staples sector ETF, has been range bound for three years, however, it has been out performing the broader market for a few months which is not a surprising defensive rotation. Price is approaching resistance so I would expect some price fade over the next several weeks. 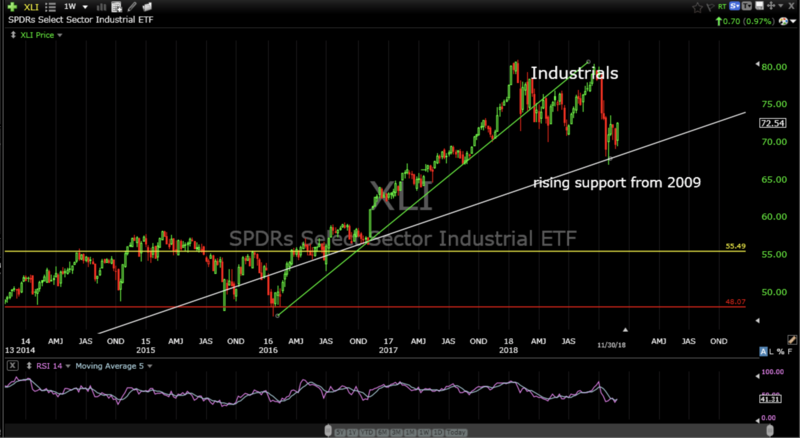 XLI, the industrial sector ETF, seems to have found strong support at the primary rising trend line support established by the lows of 2009 and 2011. This is looking good. 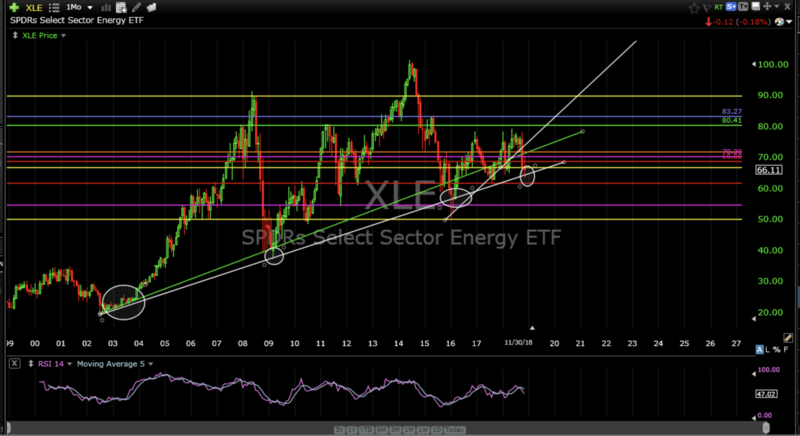 XLE, the energy sector ETF, has been all over the map this year. Could it be signaling another big leg up? The monthly chart from 1999 shows the trend line established from the 2002, 2003 and 2004 lows. This trend line provided exact support for the 175% gain from 2009 to 2014 and the 20% gain from 2016. Price is right back at this trend line which was established from range lows and the November monthly close tested this support and got bid up. Energy has been very difficult to trade but can be quite rewarding. 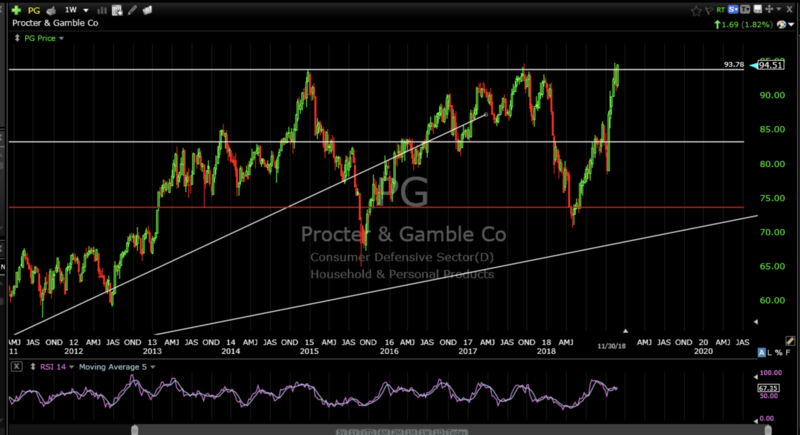 I’m expecting a nice bounce from this area and am long XLE. XLB, the materials sector ETF, is also getting bid up at support; the highs from early 2015. It’s not the greatest support but it’s support and it got a slight bid so that’s better than the alternative. 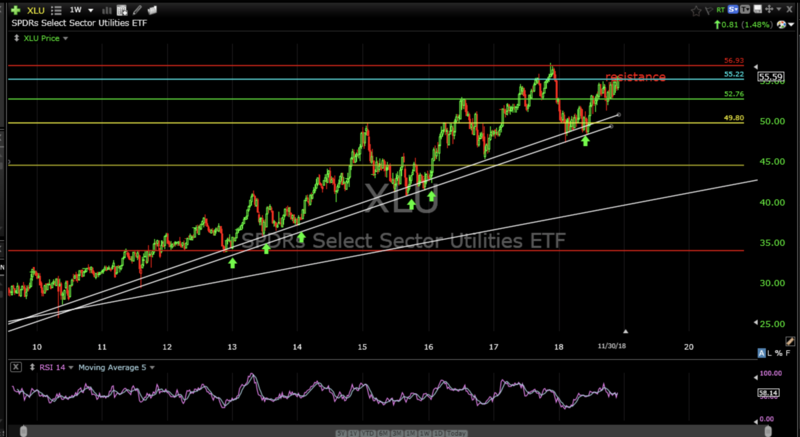 XLU, the utilities sector ETF, continues to grind higher off primary support from the 2009 lows. Next resistance is the all time high from 2017. I would continue to hold. I’m long. 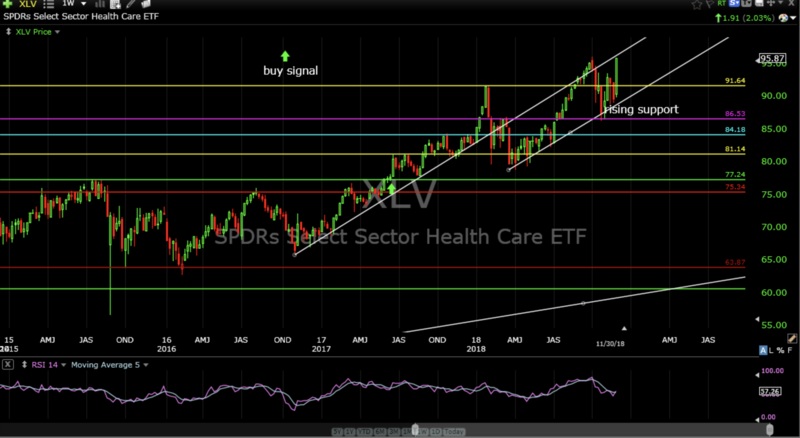 XLV, the health care sector ETF, made a new all time closing high and continues to rip. I would continue to hold it. I’m long. 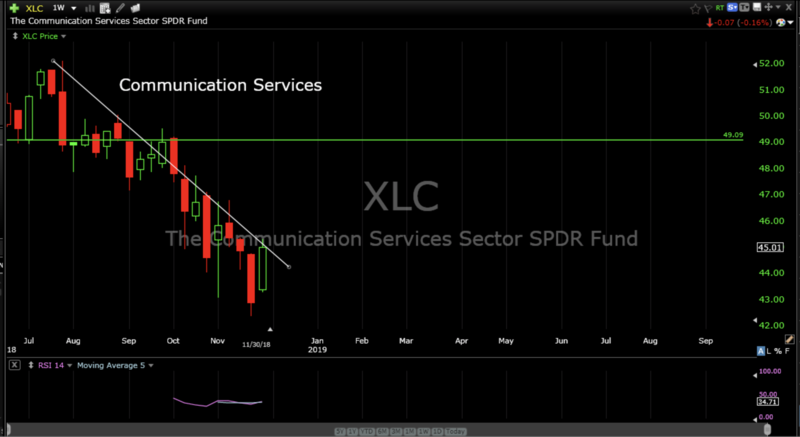 XLC, the communications services sector ETF, still looks like crap. I wouldn’t touch it now. 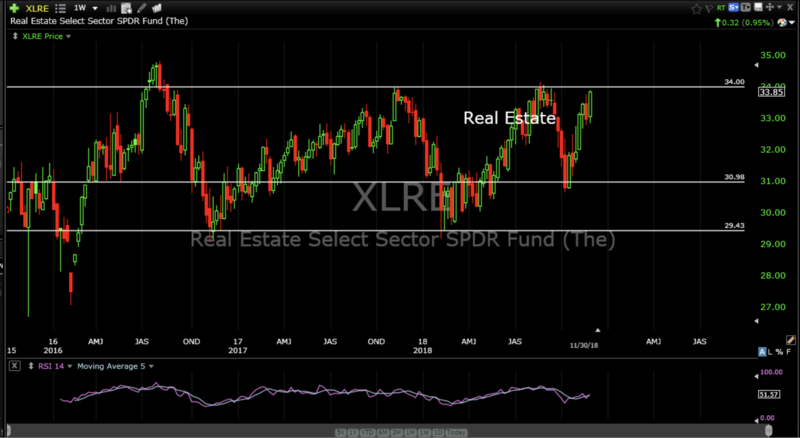 XLRE, the real estate sector ETF, can’t get out of it’s own shadow. It is basically range bound between 29 and 34. Traders can sell 34 and buy 29 until it doesn’t work then a breakout is likely, one way or the other. So while there are chinks in the armor there are glints of light. The regime has changed a bit from the tech high fliers to soda pop, coffee and soap. 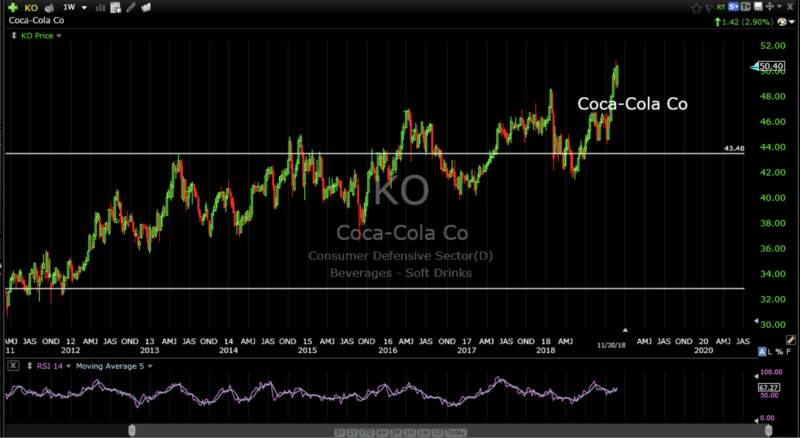 Coca-Cola Co (KO), Starbucks Corporation (SBUX) and Proctor and Gamble Co (PG) are making new highs as we speak. The looming opportunities are starting to come into view. In a separate email this week I will highlight a few individual stocks that look to be good entry candidates.